This is the second newsletter in a series of four for those who had downloaded a trial version of the menu designer tool CD-Menu Creator from SamLogic Software. In this issue we will cover a very important part of a menu: the buttons. We will give examples of how buttons can be designed, and we have included links to useful step-by-step tips that show how to use the buttons in a menu interface. 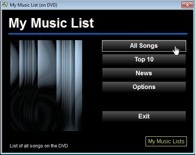 #1 - Why create a menu interface for a CD, DVD or USB stick? Good design is important nowadays. And most important is often the first impression. When you distribute software via a CD, DVD or USB flash drive you have the opportunity to give your user a great first expression by adding a beautiful and professional menu interface. The picture above shows buttons that fades vertically between two colors. In the top of a button gray color is used and in the bottom of a button black color used. By changing color from one color to another in this way a color gradient effect is created. The picture above shows buttons with a cylindrical color gradient, which also is combined with a light reflector on the top of the button. This gives the illusion of a three-dimensional metal surface, in this case gold. This is a new style that we added recently. It is buttons with a plastic style, which will give your menu interfaces a modern design. Buttons can also be partially transparent. The background is then partially visible trough the button. You can choose how much of the background that should be visible through the button (the opacity). It is possible to specify unique text colors for buttons in a menu. For example, the Exit button can have a different text color than the other buttons, so it can be easier located in a menu. This tip shows how to open a PDF document from a button in a menu. When the end-user clicks on the button, the PDF document is opened in a PDF viewer. You can also order the latest Media Tools suite (where the 2 tools above are included). You will also get 1 year support & updates. This is a web copy of the newsletter. The email version of the newsletter was sent with SamLogic MultiMailer.